Going into his fourth professional season in 1989, Willie Smith was due for a career turning point, his manager at single-A the year before, Woody Huyke, told The Pittsburgh Post Gazette. "He's made steady progress," Huyke told The Post-Gazette as Smith prepared for spring camp. "He's never stood still or gone backward. But now he'll start to get the message about what it takes to be a major leaguer." Smith ultimately did have what it took to be a major leaguer. But that didn't come for another five years and after losing a season to shoulder surgery. Smith's career began in 1986, with the 6-foot, 6-inch right-hander signed by the Pirates as an undrafted free agent, out of Savannah, Ga. Smith played that first year in the rookie Gulf Coast League, playing rookie ball and short-season ball in 1987. At single-A Augusta in 1988, Smith posted a 2.98 ERA, while recording six saves in 30 outings. In 1989, it was single-A Salem and AA Harrisburg. At Harrisburg, Smith got 12 outings, giving up five earned runs in 18.1 innings of work. That December, Smith arrived in the Yankees system, in a three-player deal. In 1990, Smith got his first look at AAA, at Columbus. He got 33 outings there, picking up seven saves. Smith also got time at AA Albany-Colonie in 1990. In 1991, all he saw was AA. Turning starter, he went 7-7, with a 4.15 ERA. Early that April, Smith went three innings in a start, giving up two runs before being pulled. "I think he threw too many fastballs," Albany manager Dan Radison told The Reading Eagle. "Once he starts mixing up his pitches a little bit better, he'll be real good." 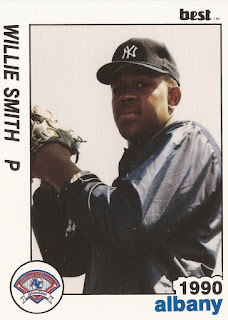 Smith moved to the Indians system in 1992, playing between AA Canton and AAA Colorado Springs. He then lost all of 1993 to shoulder surgery. But Smith came back. For 1994, he signed with the Cardinals. He debuted in the majors April 25. He only got into seven more big league games. With an injury to the Cardinals' designated closer Mike Perez, there was thought to give Smith a shot at closing. Smith, though, never got a save. In seven innings of work, Smith gave up seven earned runs. He also gave up four home runs, one of them to Bobby Bonilla May 8. Smith also picked up one win to one loss. Sent back down upon Perez' return, Smith played out the season at AAA Louisville. There, Smith picked up 29 saves. It was enough for the Indians to sign Smith for 1995. With the Indians, though, Smith didn't last through to the season. He ruptured a ligament in his throwing elbow in an exhibition game. The injury effectively ended Smith's career.